Our legal team at the Lenahan Law Firm has achieved many notable victories in difficult serious injury cases. We limit the number of cases we take on so that each individual or family gets the level of representation that we believe should be expected, but is very rare to find. Are you or a loved one suffering from a serious injury as the result of an act of negligence? We believe that you deserve to recover the maximum in compensation, and we have the qualifications to get the job done for you. Oil companies provide us with ongoing work and income, allowing us to provide for our families. The flip side of this story is that when a person is injured while working for one of these companies, recovering fair compensation is often aggressively challenged, usually by a team of 3 – 10 corporate defense lawyers. No matter how clear it may be that the oil company has failed to provide safe working conditions, leading to serious injuries or death, you can expect the claim to be fought tooth and nail. We take on the tough cases and win, and our goal is to achieve justice and full compensation. With a former insurance company defense lawyer on our team, we can predict the actions that will be taken by the oil company, and we are ready for any challenge. We are not intimidated by corporate defense lawyers, and we know how these firms operate and what to do to hold a negligent party accountable, and we will pursue the maximum in compensation. Our legal team is talented, professional, and recognized for getting results. Our lead attorney, Marc Lenahan is a lifetime member of the Multi-Million Dollar Advocates Forum, has been listed in Super Lawyers, and has gathered together one of the top professional personal injury teams in the country. We Never Take a Check From Our Clients. At our firm, we never take a check from our clients, and we provide legal services strictly on a contingency fee basis. If we are successful in recovering damages in your case, we will be paid for our legal fees and expenses. Our founder, Marc Lenahan, is the top-rated Texas personal injury lawyer on Avvo, and has a long list of honors and accolades for his legal work, and the respect of the legal community for his dedication and legal skills. The team at the firm has truly outstanding qualifications, and is so confident in the ability to succeed that we operate on a contingency fee basis. We are here to get to work and pursue a win for you. 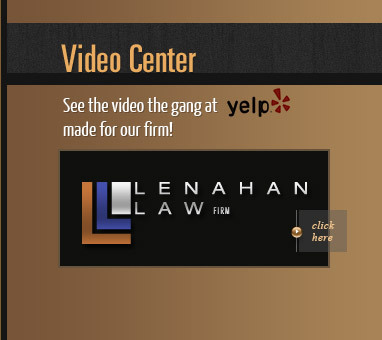 Contact our professional team at the Lenahan Law Firm today. We offer a free case evaluation to get you started.